Cook fettuccine to desired doneness as directed on package. Drain; return to saucepan. 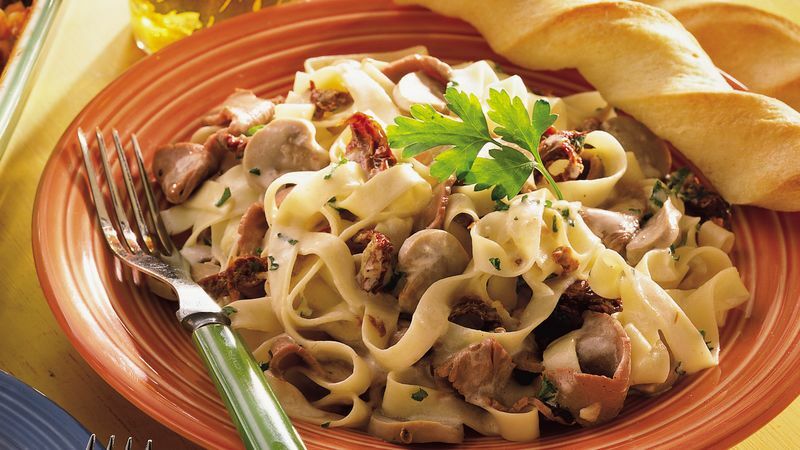 Stir in roast beef, tomatoes, 2 tablespoons reserved tomato liquid, mushrooms and half-and-half. Cook over low heat until thoroughly heated, stirring occasionally. Stir in cheese. Cook and stir until cheese is melted and sauce is slightly thickened. Stir in parsley. If desired, garnish with additional shredded fresh Parmesan cheese. Leftover cooked roast beef is perfect for this recipe. Otherwise, purchase packaged sliced roast beef for sandwiches or cooked roast beef from the deli. About 8 oz. of dry fettuccine can be used in place of the refrigerated pasta in this recipe. Dry pasta needs to cook longer than refrigerated pasta; use the cooking time printed on the package. Just before beginning this super-quick fettuccine, pop some Pillsbury Refrigerated Breadsticks into the oven to bake while you prepare the recipe.